Ram Charan sits at the intersection of practice and theory. We would do well to meet him there. Know-how is what separates leaders who perform – who deliver results — from those who don’t. It’s the hallmark of people who know what they’re doing, those who build long-term intrinsic value and hit short-term targets.Know-How, page 1. (5) Molding a Team; (6) Setting goals; (7) Setting Laser-Sharp Priorities; (8) Dealing with Forces Beyond the Market. Don't let the familiarity and "obvious" nature of some of these factors detract you from reading Know-How. His insights on goal setting and priorities are worth the price of the book and then some -- and the balance of his work is similarly impacting. 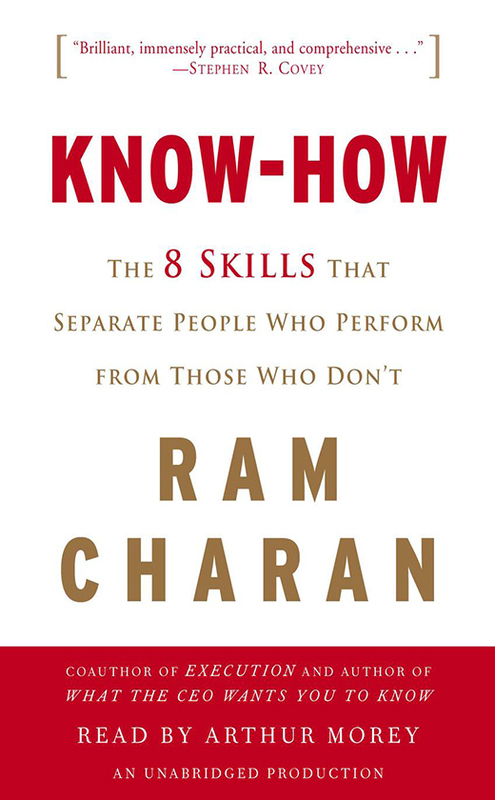 Ram Charan demonstrates why we need thought leaders -- those whose operate conceptually and help us see what we don't -- and act on it. Know-How is the kind of book of which Francis Bacon said must be "chewed and digested." There is so much insight, wisdom, business acumen, and leadership savvy you have to wrestle with it, embrace it, and implement it. Know-How is praxis at it's best. 1. Summary -- End-of-chapter summaries are outstanding as quick guide for key learnings and implementation. His summary of the eight "know-hows" at the conclusion of his book is fantastic. 2. Insight -- Charan is helping me see beyond what I normally see. His insight and perspective on how to address business-related threats, for instance, was extremely beneficial. 3. Praxis -- Charan builds theory and offers practical application from a lifetime of observation and deep engagement in the business environment. 4. Depth -- Know-How provides in-depth analysis of each of the eight factors. This is why we appreciate blogs, but need books. The good ones take us deeper. This is a good one. 5. Thought -- Charan reminds me that leadership is a thinking game. I must pull back from the day-to-day (or in the day-to-day) and assess so I may better engage and lead.